HOCKEY JERSEYS DIY & OTHERWISE (plus more): Hamilton Steelheads 3rd jersey? Found a jersey on Ebay with the same striping pattern as the Hamilton Steelheads one. Removed the crest on front but was a fair bit of glue residue left so I used some Goof Off to remove the majority of the residue. Also removed the Concrete Pond front patch. Left the back number and 'A' on as is. 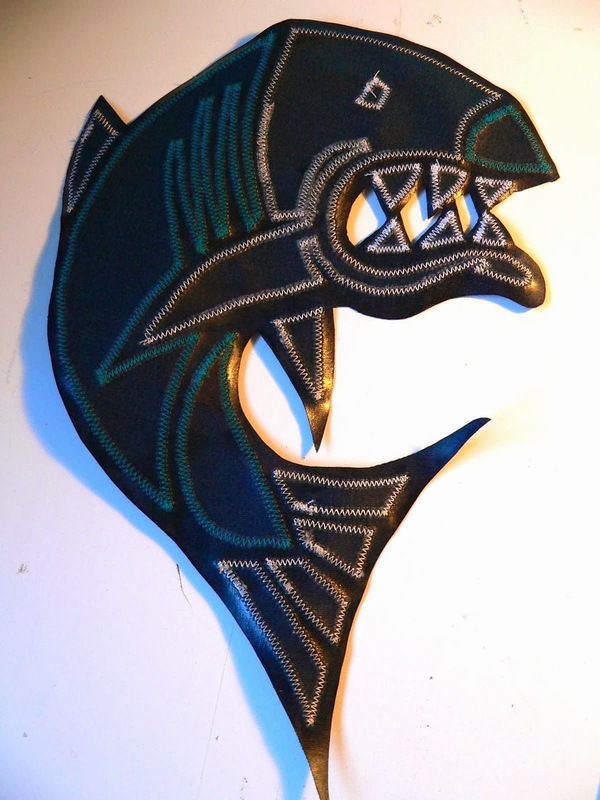 Decided to use the fish from the shoulder crest of the actual Steelheads jersey as the main crest. 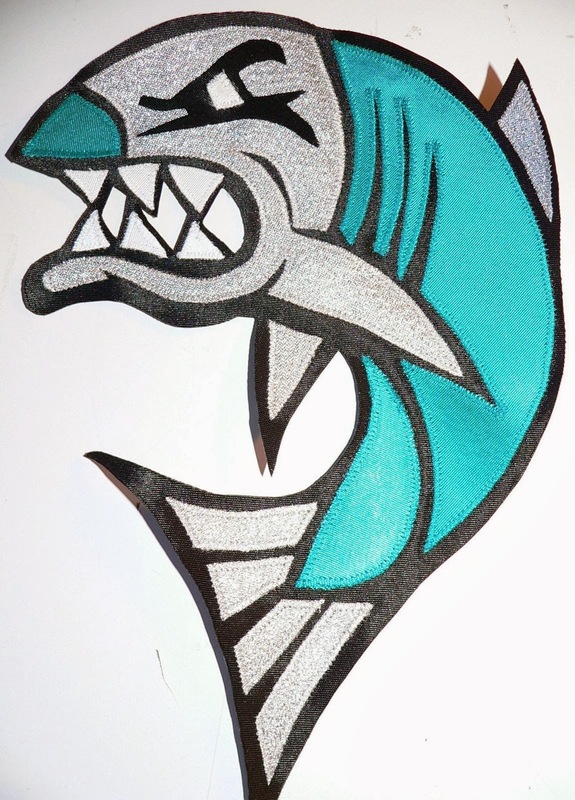 Was originally going to recreate the shoulder patch as a main crest with the gold shield like shape, but decided instead to just use the fish. Scanned and made an enlarged photocopy of shoulder patch for template for the crest and went through my usual procedure for making the crest. Here's the back of the crest. 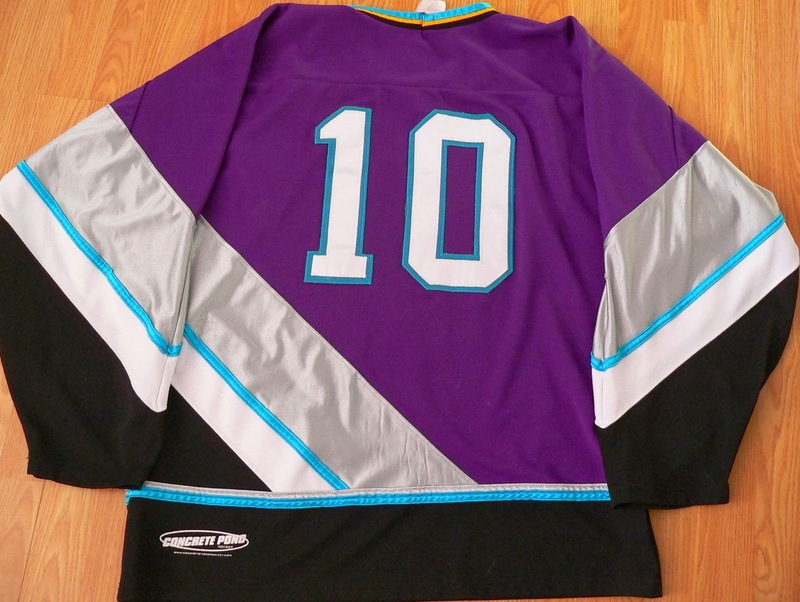 You can see where I forgot to sew on the black eye shape before putting it on the jersey. Sewed the crest on jersey and then sewed the black eye area I previously missed. With the gold around the collar, jersey looks a little incomplete without gold anywhere else. Could cover up the gold on the collar. 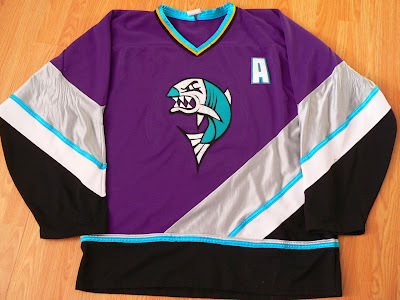 Maybe I could add a thin diagonal stripe or a add a variation of the 'STEEHEADS' that is diagonally across the lower section of the actual jersey. Arm numbers with gold is another idea. Thought of adding a shoulder patch, but haven't as of yet thought of a design I like for the shoulder patches - if I'm making it, it has to be fairly simple as embroidery would be the best way for very small detail and my couple attempts at hand embroidery sucked. As the goalie in the crest of the actual jersey has a welding mask, was thinking of a welding mask or something to do with welding or steel working - sketched a few ideas but nothing I came up with really grabbed me. Another idea would be to get a patch to do with the Department of Fisheries (or DFO or Fisheries and Oceans Canada as it is known now) as that Canadian Government department took over the team for a while in Season 2. Another Possibility is an old Steelworkers Union patch. 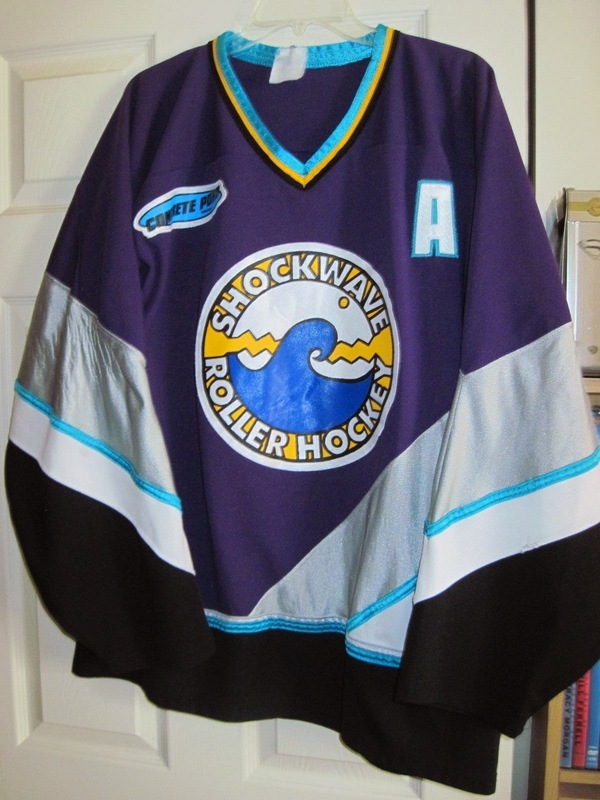 In any case, the jersey is done - at least for the time being.